Why Choose Digicase Contact Lens Cases? Are you putting your eyes at risk by over-wearing your lenses? If you’re putting your eyes at risk by over-wearing your lenses – you should consider the digicase contact lens storage case NOW! digicase is a revolutionary contact lens holder which reminds you when to change your lenses, on time, every time. digicase is sleek, modern, easy to use – and the optically correct mirror in the lid means you can change lenses on the go, wherever you are. Just drop your lenses in the FDA-approved, leak-proof, screw top lens case, set the digital reminder for 14 or 30 days – & you’re done! Replaceable watch battery inside case. 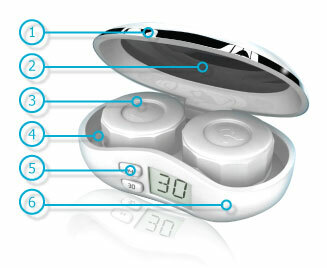 14 and 30 day timer options with LCD screen and sounding timer system. ABS designer outer shell manufactured and assembled under EN ISO 13485 and ISO9001 quality systems.